But we have an ace up our sleeves. No building codes. That’s right. No codes, and no property tax. And that will be our saving grace. No home inspector will give us a loan, sure. But if we’re saving 17,000 on something we don’t value all that much, we’d consider that a win. I’ve spent a lot of time wondering where I’ll spend the next fifty years pooping. Before this summer I’d thought a lot about where my water came from, where my food originated and how it was treated before it reached me. But I’d given little thought to where it went after it exited and reached the porcelain throne. Like a lot of our ideas and schemes, it originated with the aforementioned Hank Lentfer and Anya Maier. The same couple that just hooked up running water in the last handful of years, have the best garden I’ve ever laid eyes on, and are considered borderline superheroes in the Cannamore household. In what must be considered the highest of honors, Hank and Anya gifted us their old outhouse. This thing is a beast. To say it’s overbuilt would be an understatement. That’s not a criticism, Hank is a hell of a wood worker, and when it came to this outhouse he cut no corners. It’s a freaking battering ram and weighs about as much as one. “Oh yea, it’s all yours,” he says beaming. “We just… well I never imagined moving it.” After a couple decades of dedicated use, it sure doesn’t look like it’s in a hurry to move. Pier blocks are nailed into all four legs and embedded deep in the ground. Hank hands me a Cat’s Paw and a crow bar and we begin to swing at the nails. Bit by bit, the nails holding the blocks and a roof the size of a Cessna come loose. By now Patrick Hanson has shown up and Hank’s daughter Linnea is overseeing the whole operation. We remove the roof without a hitch and stare at the structure. I give it a gentle push and feel the weight of multiple 2 X 6’s, 6 X 6’s and plywood. At last we get the bright idea to put the outhouse on its side and rest it on the back of a boat trailer. Hank, Brittney, Patrick, Linnea, Anya, and myself drag it across the Lentfer/Maier’s meadow and hitch it to the back of the truck and endure the longest quarter mile drive in human history down the road to our place. Patrick, Brittney, and I follow in the Pathfinder while Linnea rides in the bed of the pickup, ensuring the Thunder Hole doesn’t tumble over the side. Together we make up the most ridiculous parade in humane history, sweet little Linnea the Queen of Thunder Holes. Hank drops the structure in our driveway. That, is a great question. And we’ve been at it for three hours already, Patrick has to go, we’re all hungry, and most importantly, we’re out of beer. No one argues, and so she sits for the next month, covered with a tarp as the never ending summer rain pummels southeast Alaska. The outhouse is ten feet tall and five by four feet. Like I said, a battering ram. And our ideal location is over roots and rocks and moss. I don’t know if she can be carried. And I see no way a boat trailer can maneuver the route we have in mind. Patrick Hanson is maybe six feet tall, has a curlier head of hair than me, wears glasses, and is my best friend. He is boundless energy and botanical knowledge. Part Hobbit, part six-year old, loyal IPA drinking buddy, and always generous with his time and enthusiasm. Which is why he now stands before Thunder Hole (currently accepting new name suggestions) with Brittney and myself. Also with us is Ellie. Ellie is in Gustavus for the same reason the rest of us are. Because the world left her wanting. Unlike most of us, she didn’t come here with a job lined up. She took an even bigger jump and simply showed up. She and her friend Jessie will be the first tenants of the Shabin. We’ve been homeowners for less than two months and we’re already slumlords. But first they need a place to poop. And we’ve agreed that the end of a driveway is not a savory location. It’s a bright quartet, but none of us have the faintest idea how to get a big, bulky, thousand pound piece of wood fifty through fifty yards of uneven forest floor. Left behind at the Shabin is a cornucopia of goodies, including four car tires. Our original idea is supported by all, but that doesn’t mean it’s a good one. We try to balance the outhouse on the top of the upright tires and wheel it through the woods. As any engineer could have warned us, this fails miserably. The tires immediately wobble and the whole structure nearly crumbles to the ground. We need another brain session. And a moral boost. No one will accept straight payment for their help in Gustavus. But no one, NO ONE, will pass up free beer as compensation. We crack some Sierra Nevada IPA’s and like all good laborers, stare at the problem. “I mean we could just lay it on the tires and and push it across.” Someone suggests. No one has a better idea and our beers our empty. May as well try. What follows is one of the most innovative and redneck operations I’ve ever had the pleasure of working on. Patrick and I heave, Ellie and Brittney ho, and slowly, painfully, the outhouse slides across the wood, and along the tires. Every five feet we grab the tires and roll them forward to the girls who lay them down beneath fresh planks and the process repeats itself. It’s ridiculous, superfluous, and wonderful. We whoop and holler and cheer with every tire rotation. Patrick adopts a southern accent as he is known to do when he’s excited or fishing. And after a couple more beer breaks, the outhouse is situated next to the pier blocks. All that’s left to do is stand it upright and pray that the holes I dug the day before were measured correctly. “But it still needs a name. We can’t finish if it doesn’t have a name.” Brittney insists. We look at the tires and the outrageous “road” we just took. No one’s going to top that. Skid Row it is. We stand Skid Row upright and wouldn’t you know it, three of the pier blocks are dead on. That’s 75%, I get a passing grade. I adjust the final block, and we set old Row down. We step back and look at our creation. We’re covered in clay, sweat, dirt, and our hands are coated in some weird black paint that rubbed off one of the tires. We’re also elated. We finish our beer and begin to walk back out the road. We keep shooting covert glances to our right at the outhouse perched in the woods, still swelling with pride. But fifty yards down the road, just before it bends to the right we stop. I glance at Brittney and I can tell she’s thinking what I’m thinking. Patrick voices our thoughts. It’s my fault, 100% my fault. I’m the one that orientated the pier blocks. But sure enough, Skid Row’s seat is just visible from the road, meaning someday, eventually, one of us will be seated their when visitors come calling. And we laugh. Because what else can we do? No one has any desire to move Skid Row from its new home. “That’s what tarps are for.” I insist as we walk away. And a $20 tarp sounds a heck of a lot better than a $17,000 septic system. Spring on Hanson Island is bittersweet for us. As we celebrate the sun crawling higher and higher above the mountains of Vancouver Island, we trot outside, palms and heads held skyward. We lay out on the south facing deck all afternoon, soaking up the sun and getting the greatest outdoor bathtub in the world up and running. After a long, windy winter that was defined by the height of the waves and the thunder of the wind, these sunlit days are nothing short of Nirvana. But in the back of our minds, we know the countdown has begun. That these days are fleeting, and the days of cleaning, organizing, and packing are fast approaching. We have less than a week remaining before, like the geese flying above, we flock north. Didn’t we just get here? Weren’t we just winging our way south, watching the the islands and inlets crawl by? Winter always seems to slip through our fingers like sand. Blink and its April. This is our life. Every six months we pack everything and shove a resigned kitty and rabbit in the car, our penance for loving two places that are far from easy to reach. But before we return to a land with bigger glaciers and smaller trees, we reflect on another winter that has taught us much. It’s hard to think of Hanson Island as rustic. Sure, there’s no warm running water or indoor plumbing. But we have a full size fridge, wireless internet, and the ocean at arms reach. In many ways, living in a New York apartment would feel more oppressive, more difficult. The constant artificial lights, the blaring car horns, the masses of humanity. More restraining than the borders of this little island. Where I walk into the forest and hear a Thrush and Woodpecker, or sit on the deck and hear the breath of an Orca a mile away. Things like warm water and flush toilets feel unnecessary. Give me creatures over convenience, stars over street lamps. Which is all well and good, until the generator won’t turn over on a cloudy morning, the lab batteries failing and the lights flickering. Or the boat engine suddenly refuses to start as the water’s churn in Blackney Pass. Or you wake up in a cold sweat in the middle of the night, the window panes rattling the waves pounding, and your fear of the boat getting swept away in full swing. Than an apartment with running water, reliable lights, and a corner store sound pretty good. So I remind myself of what these inconveniences do. They pull me back to my roots. Remind me that the things we take for granted we shouldn’t. That it’s important to know where our electricity, our fuel, our freshwater come from. And even more, it gives you a personal stake when the only one that can fix it, is you. A month ago, the generator, died. Not an old generator mind you, but a brand new one. My generator knowledge began and ended with: “turn the key, push the choke in, go back inside.” I went inside, found the dusty owners manual, and marched back to the generator shed without the faintest idea of what I was doing. I opened the maintenance door and stared at its innards. I traced the fuel line, opened the spark plug compartment, and shook my head. If I lived in a city, I’d call the power company and wait impatiently for someone to fix the problem. I had no one to complain to, no one to lean on but me. Thirty minutes later, my fingers coated with fuel, oil, and grime, I slammed the maintenance door shut. With a knot of apprehension, I filled the generator with gas, pulled the choke, and turned the key. Fifteen seconds later, the blasted thing came to life. I walked back to the cabin with a sense of accomplishment. I love having our source of fresh water, our power, our food squarely in my control. As hard as it can be, it gives me an emotional investment in their sources. Inconvenient or not, I’m grateful. I want that sort of control, that responsibility when I have my own place. I want solar panels, ground water, a garden, and a wood stove. I have Hanson Island to thank for that. For giving me an intimate connection to the services that it’s so easy to take for granted. After 27-years of turning taps and opening the fridge with little knowledge of where their sources originated, I don’t think I can ever live that way again. Maybe I’ll just have to be rustic forever. Johnstone strait is empty. A gentle northwest wind ripples down the passage, pushing my tiny boat east. Have I ever seen the strait completely devoid of human existence? I can’t remember, I certainly haven’t in summer. There were nights when the the fishing fleet anchored against the Vancouver shoreline drowned out the stars with their anchor lights. I’d lay on the deck at the Cracroft Point outcamp looking across the strait, the lights bobbing like little lanterns from Robson Bight to Telegraph Cove. But today it’s just me, in my glorified bathtub of a boat. The wind and damp air makes me shiver beneath my sweater. The strait feels odd in winter, devoid of boats, kayaks, and Orcas. I glance hopefully at the green carpeted shoreline of Vancouver Island, looking for the rhythmic rise and fall of a scimitar shaped fin. The mountains free fall thousands of feet straight into the ocean. Their peaks smothering the sun as we pivot around the winter solstice. But their shadows turn the strait emerald green. It was this color that I remembered more than anything during my six year hiatus from this place. The trees bearded in lichen, their shadows falling into the water. They silhouette the black and white backs of the whales when they’re here. Complimenting each other perfectly, like the entwined fingers of two lovers. The boat plows through a rain cloud and drops pepper the windshield. I’m on my way from Alert Bay to the lab, with a couple of pit stops along the way. “On your way home, could you run the generators at CP and Parson Island?” Paul asks as if he’s asking me to pick up a gallon of milk at the store. Our power issue has become something of a saga. With all of technologies marvels, line of sight is still tantamount to keeping our daisy chained internet connection established. The signal runs from Alert Bay and on a line above me and the boat to CP, its white lighthouse and the lab’s green shack materializing out of the fog. The signal is bounced from CP across the water a mile to Parson Island. This allows the connection to round the eastern corner of Hanson Island. From Parson it’s a straight shot to the lab. But if we lose power at either CP or Parson, the system crumbles like Jenga. And with the solar panels choked for sunlight, a spotty inverter at CP, and a cranky generator on Parson, keeping the HD cameras up and streaming has become a daily battle. The rain abates as the boat brushes up against the rocks at CP. The tide is low and I crawl on hands and knees up the rocks and into the woods where the generator lives, connected by extension cords to the insatiable solar batteries. It’s only three in the afternoon but the sun long ago vanished behind Vancouver Island’s mountains. The rain cloud I’d passed is barreling for me. With little ceremony I pull the cord on the generator, set the choke, and climb back into the boat. The 50 hp Yamaha engine roars to life and I pull away from the rocks, leaving nothing but waves lapping against the shore. The journey up Parson Island to the batteries takes you up a cliff face and through a rich display of Cedar, Spruce, and Hemlock, adorned in lichens that stick to your hat and drip water down your back. The fog settles in as I step out onto the cliff face where the camera, radio, and batteries are stored. Hanson Island just a quarter mile away vanishes behind the veil. With much protesting the generator powers up. Its voice like that of a smoker, coughing, hacking, and wheezing as it dispels precious power to the battery bank. The rain has caught up. I wrap my arms around my knees and pull my hat tight over my ears, waiting to see if the generator will run reliably. The calm water swirls with countless eddies and currents, bustling this way and that, their origin and destination no one’s business but their own. Atop them sit murres and murrelets, gulls and auklets. The land is silent save for the gull’s squawks and the exasperated yells of the murres. The weather threatens snow. It feels cold enough. In the distance I can make out the tendrils of smoke from our cabin through the fog. But as tired and cold as I am, I’m not ready to go home just yet. The sun slides clear of the mountain peaks for a moment and turns the fog gold, the rain drops glow like diamonds. From my vantage point I can see out into Johnstone Strait, the stretch of water that has changed and defined my life, has changed so many lives. But not in winter. In winter the land and ocean seems to hibernate. Queuing up for another summer that will bring the boats, the kayaks, the people, and the animals that pull them like great magnets. But for now, it’s great to watch it sleep. The breath catches in my chest, my legs wobble, and my arms shake. I try to take another step forward and feel the ground slide beneath me. Mud and its ally gravity pull me to the ground. My elbows bounce off the cedar boughs and spruce branches that carpet the hillside, my head bangs against the cardboard box in my arms. I groan and lay motionless for a moment, grateful that no one but the trees and squirrels were present to see my fall. The sound of a humpback surfacing floats through the trees from Blackney Pass 100 feet away. I roll over and look up at the tops of the trees, massaging my chin and wiping sweat from forehead. For the last twenty minutes I’ve been participating in a maniacal relay. In the six cardboard boxes are batteries. Batteries that are getting heavier every time I pick them up. Between the soothing breaths of the humpback and my more labored ones, I’ve developed a rhythm. Fifty steps. Drop. Return. Grab the next. Fifty steps. Drop. Return. Paul and I had unloaded the batteries on Parson Island, the island across Blackney Pass from Hanson Island and OrcaLab. Now he’s scurrying back to the lab to grab Brittney to monitor the boat as the tide falls. Free us to move the tedious batteries up to the Parson Island camera site. As we move the batteries into the woods we’re already panting, sweating, and shedding our wool sweaters. It’s a quarter mile to the camera site, most of it uphill. I have to agree. I could wait for Paul to get back so we can carry the batteries up the hillside together. But I’ve never been patient. Which is why I’m laying on my back, staring up at the treetops, letting the remnants of last nights rain fall from the needles and onto my face. Despite the burning in my legs and the distance still to go, it’s impossible to not be moved by the sublimity of the scene. An eagle chitters and the humpback explodes to the surface again, its breath sounding like a trumpet, the echoes bouncing off the rock cliffs. I smile and permit my eyes to close for just a moment, feel my spirit sink into the forest floor. I could lay here forever. Which is coincidentally, why I’m here in the first place. The new camera atop the Parson Island cliff demands more power than the eight Kirkland brand car batteries can provide in the winter when the sun disappears for days on end. The batteries in my arms should help the camera stream throughout the winter with minimal help from the balky generator stashed under tarps and rocks. Fifteen minutes later, the batteries are at the top of the hill. The sound of an engine floats across the water, Paul’s back. We relay the batteries together. Past a thicket of Salal and around Cedar trees. The sunlight moves through the forest, the only marker of time as the afternoon wears on. As we work the humpback continues to trace the Parson shore line. It’s surfacings the perfect background music. Soothing and relaxing to counteract our labored breathing as the relay continues. Finally we break through the salal bushes and onto the cliff overlooking Blackney Pass. The water has become a mirror. I don’t think I’ve ever seen it so calm, like liquid glass gently vibrating. I can hear the mutterings of murre’s. Random rays of sun stab through the clouds like knives and illuminate the gentle rain that has begun to fall. I’m struck dumb by the beauty. How can this not change people? We unpack the batteries and begin to hook them up. Maybe this camera will. Thirty minutes later the job is done. With our arms full of soggy and decomposing cardboard we move back down the hill. I know this trail far too well now. Walking it twelve times will do that. We board the boat and disturb that perfect stretch of water. 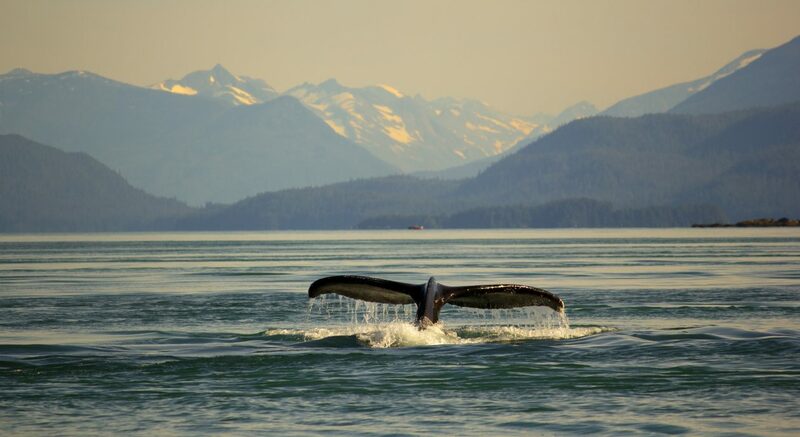 The humpbacks have moved away from Parson Island toward Johnstone Strait. Any day now they’ll swim east down the strait and set course for Hawaii. Leaving us with the sea lions and harbor seals for company. We leap neatly from the boat and onto the rocks and look out over the water. Brittney gasps. An incredible rainbow has sprung into being. As Paul motors away back toward Alert Bay he slow the boat, his phone extended through the window, photographing the picturesque scene. Even after forty some years it’s still not old to him. I sit down on the rocks and drink it in. This. This is what makes me happy, fulfilled. Hauling batteries through the woods, humpbacks in my office. Porter gives a soft meow and jogs up beside me, rubbing his face against my arm. My hand goes to my forehead and I feel the dried sweat glued to my skin. Now if only I could find some hot running water around here for a quick shower.